"The last time the San Francisco Police Department studied police shootings in The City, it found the department needed to find less lethal tools and training to ensure fewer incidents escalate into shootings." "While some of the 5-year-old study’s recommendations were implemented — and use-of-force incidents have declined since — the average number of officer shooting incidents has not changed." "The San Francisco Police Officers Association threw its support behind Chief Greg Suhr’s call for electric stun guns in the wake of the fatal Mario Woods shooting, urging city officials Wednesday to bring back a proposal that the Police Commission voted down in 2010." "San Francisco has been debating whether to arm its police force with Tasers for more than decade, with proposals to do so repeatedly rejected by opponents who say the devices are ripe for abuse." "On Wednesday, Halloran echoed Suhr’s remarks that the officers’ encounter with Woods would have ended differently with stun guns — an opinion that critics have decried as opportunistic and shortsighted." "Almost everyone these days seems to support the idea of outfitting cops with body-worn cameras. Police watchdog groups want cameras on cops to increase transparency and accountability and reduce misconduct. Police officials want to strap cameras on cops for other reasons: The technology acts as roving surveillance devices, collecting video evidence that can be used in investigations and court. Body cameras have also been used to clear officers of alleged misconduct, so a growing number of rank-and-file cops are happily strapping them on. But by far the biggest advocates of body cameras are the companies that make and sell the devices, and the cloud computing services that store and analyze the petabytes of video that the cameras generate. Police body cameras are estimated to be a billion-dollar market, and the leading vendors are now fiercely competing to prove their wares and win lucrative contracts." 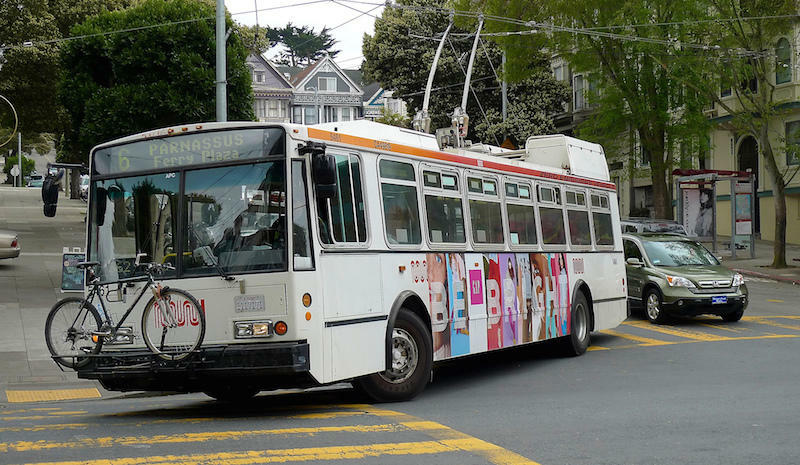 "Two electric Muni buses caught fire last week, leading to the immediate evacuation of passengers and the inspection of a substantial part of the Muni Trolley Electric Coach fleet. The fires occurred on December 8 and 10, both on buses that had been in service for almost 15 years." "In response to the incidents, Haley ordered the inspection of 298 buses in an attempt to determine if the problem was widespread." "Pacific Gas and Electric Co. has vouched for the safety of 1,000 miles of high-pressure gas pipeline since the 2010 San Bruno explosion even though it lacks the records required by federal regulations to do so, the watchdog arm of the state Public Utilities Commission alleged." "“We have plans to pressure test every mile of our gas transmission system that have previously not been tested and that’s consistent with our aggressive strength-testing program,” PG&E’s Greg Snapper said in an e-mail, adding that the company is working with regulators to answer their questions." "U. S. Customs and Border Protection Agriculture specialists discovered two live Giant African Snails - considered one of the most dangerous snails in the world - at the Port of Oakland in early December while examining a cargo shipment of wooden pallets from American Samoa." "The specimens ware collected and forwarded to the U.S. Department of Agriculture Plant Inspection Station, and digital images were sent to the USDA Systematic Entomology Laboratory, where scientists determined they were Lissachatina fulica, commonly known as the Giant African Snail. Scientists consider this mollusk one of the most damaging snails in the world."